Hi, my name is Marissa, I’m 23 years old, and I have had POTS for coming up on 2 years this summer. I actually went through my pregnancy and delivery with POTS and my son is now almost a year old. When I first came to the center 2 weeks ago, I was suffering from severe migraines daily, headaches daily, severe lightheadedness daily and chronically, fatigue, chronic fatigue, and really, really bad insomnia, really, really bad anxiety, depression, and some IBS and digestive issues. Now that I’ve been here for 2 weeks, my migraines are completely gone. They’ve been gone since about my third day of treatment, which is a really big deal for me because I suffered from them daily. My headaches have been cut by probably 60 or 70%. My lightheadedness is still…it’s been cut by about 50%, which is still a huge improvement. My anxiety has been cut probably 80-90%. And my hope for my future is 500% improved, and my hope for my child’s future as me as his mother has improved a million percent. This has been an amazing experience. Now that I’ve pulled myself together, I can explain that I got emotional because I haven’t been able to take my son out in his whole life, and we’ve been out a lot this last week. And his life is changing because my life is changing, and it’s really great. Ok, we got through that. Tell us about your journey and experience here. My getting-diagnosed-story is similar, I’m sure, to many of yours. It took a lot of time, took a lot of doctors, and even then, when I was diagnosed, doctors still didn’t know what to do with me or what to tell me. They didn’t really understand POTS the way that the people here do, and I don’t even feel like I understood POTS until I came here and sat for the first day with Dr. Kyprianou and she explained to me what was happening with my body and now I realize what I need to do to change it. It doesn’t have to be medication, and it doesn’t have to be compression stockings, and it doesn’t have to be salt – your body can fix this if you’ll let it. 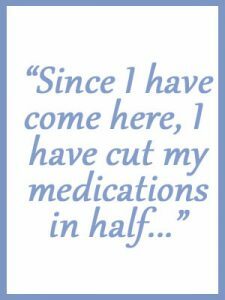 Since I came here, I’ve cut my medications in half (my dosage), and I’ve also stopped wearing compression socks, which I was wearing for about 9 months before I came here. I’m doing really, really great off the medication and off the compression socks, and I get to wear cuter clothes, which is a huge plus. This treatment is different because they give you hope, and they give you the tools you need to fix your body and to let yourself heal, and they give you peace of mind, and they give you a really, really bright future and hope for a bright future. I really appreciate that because a lot of other doctors made me lose my hope in my life and in my future so it’s been really great. What would you like to tell others? I would like to tell others that if you suffer from POTS, you don’t have to, and it’s not your fault, it’s just something that happened. Your body and your mind really, really need to heal, and they can help you heal here. And I would say, whatever it takes to get here, do it. I have a baby who’s been with me here this whole time. We’ve had to find babysitters and arrange a lot of different things and obviously, it’s a stress financially, but my advice would be do whatever you can to make it work because your life is worth a lot more than what it costs to come here. My husband and I and our future children are all very grateful, and our child is grateful that I am feeling better and happier and more hopeful. I am excited to continue my treatment at home, and I’m so excited to reach my potential and see where I can go in this life. And I’m so grateful for my renewed hope in my future and in my life.